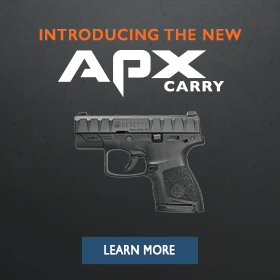 The APX Compact pistol extends the proven APX Series to a concealed carry friendly size. It features a 13+1 (9mm) or 10+1 (.40 S&W) flush fit magazine and can accept the Full/Centurion size APX magazines as well. As with all APX pistols, the Compact has been designed specifically for military and law enforcement users who have a need to carry concealed but want similar handling characteristics to their duty pistols. Striker deactivation button, firing pin block safety, trigger safety. Striker deactivation button, firing pin block safety, trigger safety.